Premiers in Episode 24 of Mobile Suit Zeta Gundam. Yazan Gable is a Titan pilot distinguished by his superb fighting skills and sheer aggression. Yazan joins the crew of the Titan cruiser Alexandria around the time of the attack on Von Braun City and becomes the ship's resident ace pilot, eclipsing the hapless Jerid Messa. Brutal and Bloodthirsty, he lives for the thrill of the hunt, and despises cautious commanders who try to spoil his fun. He's later joined by a pair of equally cunning and sadistic wingmen, Ensigns Dunkel Cooper and Ramsus Hasa. 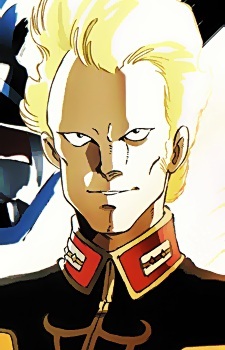 Viewed by many as the best non-newtype pilot in the Universal Century, Yazan gained fame through skill and power. Kamille Bidan had to use his newtype abilities to defeat him. He killed more AEUG members than any other Titan pilot. Also one of only a few Titan survivors at the end of the GRYPS conflict.